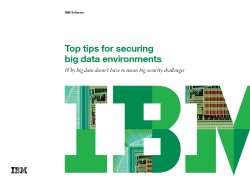 Download this white paper to find out how your organization can improve security decision-making and monitor big data environments. Protecting data security is a detailed, continuous responsibility which should be part of every best practice. Organizations that know their data is secure are more likely to gain successful analytical outputs than those who aren’t confident in their decision-making.